Ever heard the phrase, “What got you here won’t get you there?” Even if you haven’t, you probably know what it feels like. 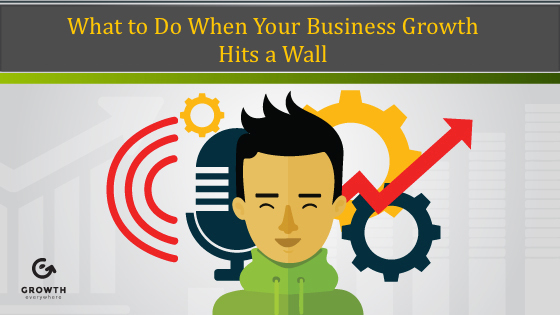 Let’s say you’ve been experiencing a string of successes, growing nonstop, when you suddenly hit a wall. Then, no matter how hard you keep trying to repeat successful habits, you just can’t get past this bottleneck. It’s like everything you’ve learned so far no longer applies. Let me give you a more concrete example of why this happens. When you’re first growing a business, you might hire a bunch of friends in the early days. You guys are working together and things are actually working out really well. Before you know it, you’re getting sales into the pipeline. You are growing 100% month over month. When you’re really small, this kind of growth is very possible, and it seems like growth is effortless. So you hire a couple people, first contractors and then full-timers, and they do a really good job for you. In the first year, things are going really well and you hit six figures in revenue. The very next year, you’re on track to do seven figures. But to go from six to seven figures, there are significant changes you have to make. You have to start thinking about scalable processes and you may consider bringing in more senior and experienced help. But you haven’t done any of this before, so you don’t know this ahead of time. Instead, you keep trying to do the same things you did in the past, but without any sign of success. Whenever a company starts out, people wear a lot of different hats. Everyone’s open to doing a lot of different things. But when you start to get to the seven-figure level and beyond, you need to hire more specialists. And when you look at companies that do over $100 million per year, you have lots of investment in operations and layers of management, too. But aren’t generalists better, you ask? Not always. For example, let’s say one of your best friends helps you build up your company and he’s a generalist marketer who’s really good at getting a lot of different things up and running. In the early days, that might be enough because he’s basically like a Swiss army knife for marketing. When you’re running on a shoestring, a self-funded budget, a Swiss army knife is a great investment. But your friend might not be the person who will take you to next level of success with your marketing. For that journey, you need someone with a more specialized set of skills, someone who really understands the nuances of your niche. Specialists are more tuned into the cutting-edge stuff that will give you an edge over the competition. The mistake that many companies make in this exact situation is they say, “Okay, let’s just stick with these guys. They’ve done a good job.” And then you stick with them for a couple years, but your growth kind of plateaus, because what got you here won’t get you there. If you don’t feel 100% confident in your conviction that this person is the right person, then you’ve got to make a change. Maybe you need to help them adjust to another role. But if that person doesn’t want to move into another role, then you’ll have to make a difficult decision. You don’t necessarily have to fire anyone. Many people can and will adapt to a new role if they like the company and if they’re compensated well. Those are the people who work really, really hard, and who love to learn. But some people may just want a standard 9-to-5 job, and they don’t want to learn new skills for new roles. I’ve been in situations before where, as a manager, I had to make those kinds of decisions. Let’s say you hire someone who’s really good at content writing, for example, and they were able to handle all your content marketing. But now you need to produce way more content, maybe even multimedia content, and you need an editor-in-chief rather than a full-time writer. Not all writers make good editors, and vice versa, so this is an example of something that could become a bottleneck. Related Content: When Business Growth Stalls: Persevere or Give Up? You need to think about these things as you continue to grow because there are people who have had a lot of experience in your niche who know exactly what to do in your situation to get to the next level. Do we have everything we need to take us to the next level? If not, what’s holding us back and what kinds of changes can we potentially make? What’s it going to cost us? These are the questions I ask myself all the time. I’m constantly looking at where Single Grain is today and where we need to go next. We’ve made some huge transitions in our time, from a brick-and-mortar SEO agency to a completely remote PPC team back to an in-person team that’s really good at paid advertising. There have been a couple of major paradigm shifts, but everyone on the team understands that we make these changes to grow the company, and everyone has to learn as needed. So, ask yourself this question every now and then: “Do we have everything we need to take us to the next level?” Because what got you here won’t necessarily get you there.